Welcome to live coverage of ESPN2′s Friday Night Fights, emanating from the Times Union Center in Albany, NY. The event will be Star Boxing’s second foray into promoting at the Times Union Center, with their first event marking the return of boxing to the facility in over a decade. 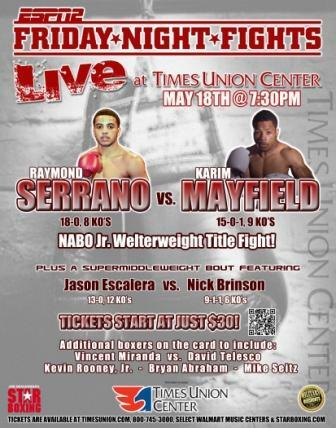 The main event will feature Raymond Serrano taking on Karim Mayfield for the NABO Jr. Welterweight Championship. In other action, undefeated Jason Escalera takes on Nick Brinson in a Super Middleweight bout. Live, real-time updates are below. Feel free to join the conversation! Just keep it civil. This entry was posted in boxing and tagged espn, espn2, friday night fights, jason escalera, karim mayfield, nick brinson, raymond serrano, star boxing by kevinmarshall.Bookmark the permalink.